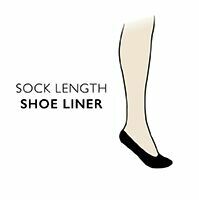 Comfortable, soft, practical… Jennifer Anderton Plain Cotton Invisible Socks are summer basics for any woman’s sock collection, able to invisibly provide a light, breathable layer in any of your shoes, from pumps and plimsolls to even the slightest of court shoes. The cotton rich content in this three-pair pack of socks is kind to feet, keeping them fresh and protected, as do the hand linked toes for smooth seams that won't rub or lump up. The socks all have silicone strips placed at the inner back heel, clinging securely but comfortably to your heel to prevent them sliding underfoot through the day.